The job is done and over, and I was replaced by the start of the next week. They didn't even try to get me to stay, which was a little shocking. My manager's final words on the matter were, "A man has to do what a man has to do". I had never made it a secret that I wasn't going to be there forever. He knows of my restless mind and ideas. He stopped over at the house several weeks back while I was literally in the middle of taking the old engine out of the motorhome. Doesn't take a genius to see my plans. Even still, I'm sure I mentioned my plans were never to leave my job this soon. The workplace had changed and I couldn't stand being there anymore. So I did what I had to do. I have been lazy this week. I know I can't be lazy. I told myself I can't be lazy or else it will become a routine. I justify it by calling this week a vacation. I just got done serving 2.5 years, surely I deserve a week to be lazy. Even still, I have managed to get a bit done on the motorhome. It's filled with coolant again. The entire front side of the engine is put together, tightened bolts and whatnot. It has been filled with oil twice now. The first time I was priming the system and 2 quarts of oil came rushing out the filter adapter plate. Apparently there WAS supposed to be a gasket there. Drain, and repeat. Gasket is in place and I put a little RTV around it for safe measure. Filled and primed tonight, and all seems well. This has not been an easy project, all of the smallest, most frustrating, things have been going wrong. That there is the end of one, actually two, annoying projects. 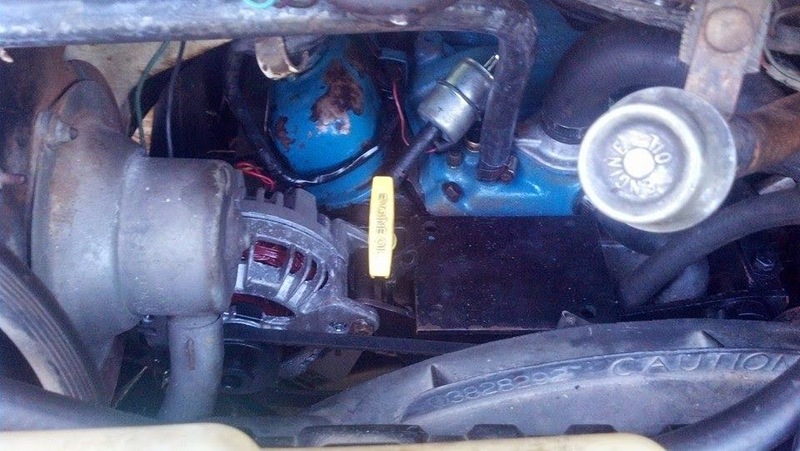 The side note is the alternator bolt there. Incredibly difficult to get lined up with the hole in the head. It's done though. The real story is that yellow dipstick. The original dipstick tube broke when I was taking the old engine out. On Monday I went to a u-wrench-it type junkyard and got a tube and dipstick off of a newer Dodge truck. It was different, but would make do. Well, last night I was installing it and it broke off in the new engine. It came out easy enough (actually, my dad got it out while I was washing up). Off to the junkyard again today. The three trucks I had in mind were not going to give up their dipstick tubes easily. I spent plenty of time and it was clear they were just going to break like the others. I had basically given up and went to look at other vehicles in the lot just for the fun of it. I found two Dodge Dakotas and noted that it looked like their tubes might be the same also. The first one I tried, wouldn't you know it, the tube came right out. I was back in business. I tried to take the other one off for a spare but it wasn't going anywhere either. Long story short, the 77 Dodge now has a dipstick tube out of a Dodge Dakota Sport of unknown year, and I kept the dipstick from the first truck.. a 97 Dodge 1500. The add and full lines don't match up, I had to make my own with a file. After the run around on something so simple / dumb, I'm fine with what I've got. I would like to think that the rest of the project will go easily. I don't foresee anymore issues. Here's hoping, but nothing about this has been easy.